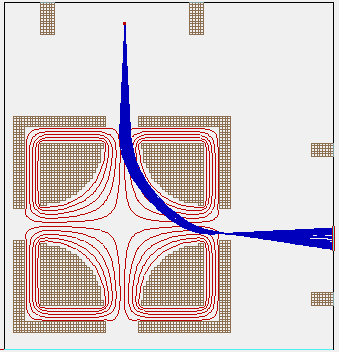 An electrostatic quadrupole beam deflector (or DC turning quadrupole/quadrupole bender) uses a DC quadrupole electric field to bend a charged particle beam 90 degrees. The bending can be switched on and off by setting the voltages (+V and -V on opposite rods for 90 degree bending and GND on all rods for no bending). A ground enclosure is placed around the rods to reduce bending outside of the 90 degree quadrant due to fringe fields. The SIMION Example: bender_cut (turning_quad_xy.gem) included an example geometry in SIMION. This example was updated in SIMION 8.1.2.20 to include the outer enclosure electrode around the rods for proper operation (reduce field outside). This uses circular rods to approximate the quadrupole field (hyperbolic potential lines), much like in SIMION Example: quad, and the ratio between rod radius and half-distance between rods remains the same. Fig. 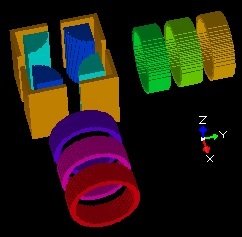 53 3D view of turning_quad_xy.gem example, which includes entrance and exit lenses. MODEL QID-900 Quadrupole Ion Deflector by Beam Imaging Solutions, provides a SIMION model of their quad deflector they sell commercially. Cross Beam Ionizer Design for Plasma Monitoring Extrel Application Note GA-511D, AVS Conference 1996. – has SIMION simulation of quad deflector. Technical Design Report for High-Precision Experiments with Traps and lasers on Exotic Isotopes at Fair. link – shows SIMION simulations of quad deflectors. KreckelBruhns2010. Kreckel, H.; Bruhns, H.; Miller, K. A.; Wa’hlin, E.; Davis, A.; Ho’ckh; S., Savin; D. W. “A simple double-focusing electrostatic ion beam deflector.” Review of Scientific Instruments, volume 81, issue 6, year 2010, pages 063304 doi:10.1063/1.3433485 link – alternative (non-quadrupole) beam deflector with SIMION simulation. Simulations also described in US patent # 8,309,936.